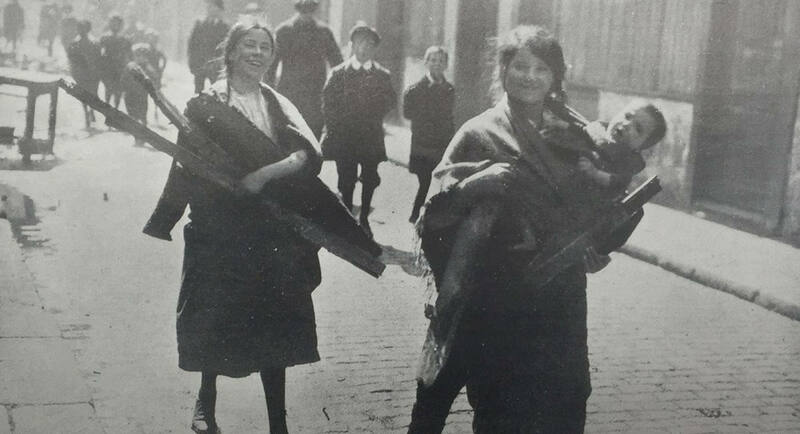 Of the 374 civilians who were killed during the Easter Rising, 40 were children aged 16 or under. As an 374 sibhialtach a fuair bás i rith Éirí Amach na Cásca, ba leanaí 40 díobh a bhí 16 bliana d’aois nó níos óige. Thirty boys and 10 girls died. Five of them were less than five years of age, two were toddlers, one is listed as an infant and two remain unidentified. Many of these children lived in Dublin's notorious tenements and had already experienced the harsh reality of Dublin life in some of Western Europe's worst slums. Fuair tríocha buachaill agus deichniúr cailíní bás. Bhí cúigear acu níos óige ná cúig bliana d’aois, ní raibh beirt acu ach ina lapadáin agus aithníodh duine eile mar naíonán. Ní fios cérbh iad an bheirt eile a bhásaigh. Bhí cónaí ar go leor de na leanaí seo i dtionóntáin mhíchlúiteacha Bhaile Átha Cliath agus bhí taithí acu cheana féin ar shaol géar na cathrach, a bhí ar cheann de na plódcheantair ba mheasa in Iarthar na hEorpa. Bridget was at home in Arran Quay in Dublin when a bullet came through her window and killed her. She worked nearby in the Altman Salt Stores. Her mother was with her when she died. Bhí Bridget sa bhaile i gCé Árann i mBaile Átha Cliath nuair a tháinig urchar trína fuinneog agus maraíodh í. Bhí sí ag obair i Stórtha Altman Salt in aice láimhe. Bhí a máthair in éineacht léi nuair a bhásaigh sí. Schoolboy Christopher lived near Merrion Square in Dublin and attended the same school as Padraig and Willie Pearse. He was giving water to a wounded combatant when he was shot in crossfire. He had two sisters and one brother, Patrick, Maria and Esther. Bhí cónaí ar Christopher, buachaill scoile, gar do Chearnóg Mhuirfean i mBaile Átha Cliath agus d’fhreastail sé ar an scoil chéanna le Pádraig agus le Willie Mac Piarais. Bhí sé ag tabhairt uisce do shaighdiúir gortaithe nuair a maraíodh sa chroslámhach é. Bhí beirt deirfiúracha agus deartháir amháin aige; Patrick, Maria agus Esther. Mary lived in Wellington Quay in Dublin City in a tenement house where the writer Sean O'Casey once lived. Mary had four sisters and one brother. She died of a fractured skull on April 28th on Wellington Street. Her father J. Brunswick, a boilerman, was with her when she died. Bhí cónaí ar Mary i gCé Wellington i gCathair Bhaile Átha Cliath i dteach tionóntán, áit a mbíodh cónaí ar an scríbhneoir Sean O’Casey tráth den saol. Bhí ceathrar deirfiúracha agus deartháir amháin ag Mary. Bhásaigh sí de bharr blaosc scoilte an 28 Aibreán ar Shráid Wellington; bhí a hathair J. Brunswick, fear a bhíodh ag deisiú coirí, in éineacht léi nuair a bhásaigh sí. Christina was the youngest identified child to die in the Rising. She was shot in her mother’s arms. The bullet went through her mother’s hand and entered Christina’s back. They were standing outside their one roomed flat at 27 Corporation Buildings. Her mother Sarah was a 'charwoman' (cleaner) who had to apply for £40 compensation for lost work owing to her bullet wound. Ba í Christina an leanbh ab óige a bhásaigh san Éirí Amach. Caitheadh í i ngabhail a máthar. Chuaigh an t-urchar trí lámh a máthar agus trí dhroim Christina. Bhí siad ina seasamh taobh amuigh dá n-árasán beag aon seomra amháin, in 27 Tithe an Bhardais, ag an am. Ba ghlantóir í Sarah a máthair agus b’éigean di iarratas a dhéanamh ar £40 cúitimh de bharr obair a chailleadh fad is a bhí sí gortaithe. Christopher was out playing with his friends in the good weather on Easter Monday when the Rising broke out. He got separated from his friends and was shot in crossfire during a gun battle at Portobello Bridge, near his Charlemont Street home. He died at Portobello Barracks. Bhí Christopher amuigh ag spraoi lena chairde san aimsir bhreá ar Luan Cásca nuair a thosaigh an tÉirí Amach. Scar sé óna chairde agus caitheadh sa chroslámhach é i rith troid gunnaí ag Droichead Portobello, gar dá theach ar Shráid Charlemont. Fuair sé bás i nDún Portobello. Charles was a member of the Irish Citizen Army and was part of a unit holding a clothing store on the corner of Parliament Street - opposite Dublin Castle. He was shot and died on the roof of the shop as he tried to warn people away. His body was brought into the grounds of Dublin Castle on 25th April 1916. Image courtesy of the National Museum of Ireland, Collins Barracks. Bhí Charles ina bhall d’Arm Cathartha na hÉireann agus é bainteach le haonad a bhí i seilbh siopa éadaí ar choirnéal Shráid na Parlaiminte – os comhair Chaisleán Bhaile Átha Cliath. Lámhachadh é agus bhásaigh sé ar dhíon an tsiopa agus é ag iarraidh rabhadh a thabhairt do dhaoine fanacht glan ar an siopa. Tugadh a chorp isteach ar thalamh Chaisleán Bhaile Átha Cliath an 25 Aibreán 1916. Moses lived near Dublin Castle, at 7 Whitefriar Street. A labourer's son, his parents had moved to Dublin from Wicklow. Moses was shot at his home on Easter Monday, April 24th 1916. He is buried in an unmarked grave in Glasnevin Cemetery. Bhí cónaí ar Moses gar do Chaisleán Bhaile Átha Cliath, i 7 Sráid na mBráithre Bána. Mac oibrí saothair, bhog a thuismitheoirí go Baile Átha Cliath as Cill Mhantáin. Lámhachadh Moses ag a theach ar Luan Cásca, an 24 Aibreán 1916. Tá sé curtha in uaigh gan ainm i Reilig Ghlas Naíon. Patrick lived in a tenement in Long Lane near Dorset Street in the north of the city. He was out and about with friends when he was shot in the thigh on Easter Monday 1916. When his mother was alerted, she put him into his boxcar and rushed him to Jervis Street Hospital - Patrick bled to death before he got there. Bhí cónaí ar Patrick i dtionóntán sa Lána Fada gar do Shráid Dorset ó thuaidh den chathair. Bhí sé amuigh lena chairde nuair a caitheadh sa cheathrú é ar Luan Cásca 1916. Nuair a tugadh scéala dá mháthair, chuir sí isteach ina vaigín earraí dúnta é agus thug sí go hOspidéal Shráid Jervis é – bhí a chuid fola rite sular shroich sé an t-ospidéal. Sean was one of the first victims of the Rising and one of the youngest children to die during Easter 1916. He was shot in his pram on Easter Monday morning in a gun battle. His father had died in World War I. Sean and his mother were on their way to a Feis Ceoil in the Father Mathew Hall on Church Street when he was shot. Bhí Sean ar dhuine de na chéad daoine a maraíodh san Éirí Amach agus ar dhuine de na leanaí ab óige a cailleadh i rith na Cásca i 1916. Caitheadh é ina naí-chóiste ar maidin Luan Cásca i gcath gunnaí. Bhí a athair tar éis bás a fháil sa Chéad Chogadh Domhanda. Bhí Seán agus a mháthair ar a mbealach chuig Feis Ceoil i Halla an Athar Maitiú ar Shráid an Teampaill nuair a lámhachadh é.
James was a member of Na Fianna. He was killed in a trench in St. Stephen’s Green, near the Royal College of Surgeons. He was the youngest of a family who lived in Cabra. Ba bhall de na Fianna é James. Maraíodh é i dtrinse ar Fhaiche Stiabhna, gar do Choláiste Ríoga na Máinleá. Ba é ab óige ina chlann, a raibh cónaí orthu sa Chabrach. William was the youngest of five children of Edward and Alice Fox. They lived with three other families in Summerhill. William was a stonemason's apprentice. He died of his wounds after being shot outside the Pro-Cathedral on Marlborough Street, April 25th 1916. Bhí é William an duine ab óige de chúigear clainne le Edward agus Alice Fox. Bhí cónaí orthu in éineacht le trí theaghlach eile i gCnoc an tSamhraidh. Ba phrintíseach le saor cloiche é William a cailleadh tar éis gortuithe i ndiaidh a lámhachta lasmuigh den Leas-Ardeaglais ar Shráid Mhaoilbhríde, an 25 Aibreán 1916. Neville was in the Canadian Army, having emigrated to Canada some years previously. Like many young men at the time, he had lied about his age to sign up. Neville was sent to Liverpool to fight in World War I. He got leave from his duties for Easter and travelled to Dublin, most likely to visit his sister who lived in Rathmines. He was shot outside Trinity College while wearing his Canadian uniform. Bhí Neville in Arm Cheanada, toisc go ndeachaigh sé ar imirce go Ceanada roinnt blianta roimhe sin. Ach an oiread le go leor de na fir óga ag an am, d’inis sé bréag faoina aois le dul isteach san arm. Cuireadh Neville go Learpholl leis an arm le dul ag troid sa Chéad Chogadh Domhanda. Fuair sé saoire óna chuid dualgas le haghaidh na Cásca agus chuaigh sé go Baile Átha Cliath. Seans go ndeachaigh sé ann chun casadh lena dheirfiúr a bhí ina cónaí i Ráth Maonais. Lámhachadh é lasmuigh de Choláiste na Tríonóide agus éide Cheanada á chaitheamh aige. John was from Henrietta Place in Dublin City Centre. He died as a result of cannon fire. He had already suffered from heart disease. He was buried in Glasnevin Cemetery. Ba as Plás Henrietta i Lár Chathair Bhaile Átha Cliath do John. Bhásaigh sé de bharr a chaite ó ghunna mór. Bhí galar croí ag dul dó roimhe sin. Cuireadh é i Reilig Ghlas Naíon. Sean was a messenger boy for Na Fianna in 1916. He was sent home by Thomas MacDonagh, one of the leaders of the Easter Rising, for being too young to take part in the fighting. He was accidentally hit by a ricochet bullet near his home in Phibsborough on Easter Monday. He died in the Mater Hospital two days later. Bhí Seán mar theachtaire do na Fianna i 1916. Chuir Tomás Mac Donnchadha, duine de cheannairí Éirí Amach na Cásca abhaile é, toisc go raibh sé ró-óg le páirt a ghlacadh sa trodaíocht. Bhuail urchar athscinnidh de thimpiste é gar dá theach i mBaile Phib ar Luan Cásca. Fuair sé bás in Ospidéal an Mater dhá lá ina dhiaidh sin. Christopher was 16 when he died in the North King Street Massacre along with his father. He was an only child. His father owned a butcher shop and he worked there. On Saturday 29th April they were both shot by the South Staffordshire Regiment of the British Army along with 12 other civilians. Christopher is said to have pleaded for his father's life. Bhí Christopher 16 bliana d’aois nuair a fuair sé bás i Sléacht Shráid an Rí Thuaidh in éineacht lena athair. Ní raibh aon deartháir ná deirfiúr aige. Bhí siopa búistéara ag a athair agus bhí sé ag obair ann. Dé Sathairn, an 29 Aibreán lámhaigh Reisimint South Staffordshire d’Arm na Breataine an bheirt in éineacht le dháréag eile. Deirtear gur phléadáil Christopher go dtabharfaí slán a athair. Patrick was a paperboy from Cumberland Street. His mother was from Meath and his father was a quay labourer from Limerick. He was out playing football in the back yard of a tenement house when he was shot. Ba bhuachaill seachadta nuachtán é Patrick ó Shráid Cumberland. Ba as an Mhí dá mháthair agus b’oibrí cé as Luimneach é a athair. Bhí sé ag imirt peile i gclós teach tionóntán nuair a lámhachadh é.
Charles lived on North King Street with his parents and his two sisters. He died from the 'effects of bullet', sustained near the top of Sackville Street (now O'Connell Street), by the Ambassador Cinema. Charles was admitted to hospital but due to the widespread fighting, doctors found it difficult to gain entry into the city's hospitals. Bhí cónaí ar Charles ar Shráid an Rí Thuaidh in éineacht lena athair, Denis, a mháthair, Mary; agus a bheirt deirfiúracha Elizabeth agus Bridget. Bhásaigh sé de bharr gortuithe urchair, a bhain dó nuair a caitheadh leis ar bharr Shráid Sackville (Sráid Uí Chonaill anois), gar do Phictiúrlann an Ambassador. Cuireadh Charles san ospidéal ach mar gheall ar an trodaíocht fhairsing, bhí sé deacair ar na dochtúirí dul chomh fada le hospidéil na cathrach. James was a young apprentice in the Broadstone Railway yard. He was killed on Tuesday, 25th April, by a gunshot wound to the head. B’oibrí óg é James. D’oibrigh sé i gclós Iarnród Broadstone áit a raibh sé ag obair mar phrintíseach. Maraíodh é Dé Máirt, an 25 Aibreán tar éis ar caitheadh sa cheann é.
Mary was 12 years old when she was shot on Lombard Street on the last day of the Rising, Saturday April 29th. She died from the gunshot wound. Mary’s father was a soldier in the British Army. Bhí Mary 12 bhliain d’aois nuair a lámhachadh í ar Shráid Lombard ar an lá deiridh den Éirí Amach, Dé Sathairn, an 29 Aibreán. Bhásaigh sí de bharr a caite. Ba shaighdiúir in Arm na Breataine athair Mary. Patrick died on 28th April from a gunshot wound to the neck. He was 12 years old and one of five children living with his parents in a tenement in the centre of Dublin. He is buried in County Meath. Fuair Patrick bás an 28 Aibreán i rith Éirí Amach na Cásca de bharr gortuithe a bhain dó nuair a caitheadh sa mhuineál é. Bhí sé 12 bhliain d’aois nuair a fuair sé bás, duine de chúigear leanaí a bhí ina gcónaí lena thuismitheoirí i dtionóntán i lár Bhaile Átha Cliath. Cuireadh é i gContae na Mí. John went missing on Easter Monday, April 24th. His family put a notice in the paper to help them find him. He was shot on Easter Monday and died from the gunshot wound. His mother identified him from a lucky coin he had in his pocket from his confirmation. Chuaigh John ar iarraidh ar Luan Cásca, an 24 Aibreán. Chuir a theaghlach fógra sa pháipéar chun cuidiú leo é a aimsiú. Lámhachadh é ar Luan Cásca agus bhásaigh sé de bharr a ghortuithe. Bhí a fhios ag a mháthair gurb é a bhí ann de bharr bonn ádhúil a fuair sí ina phóca, a fuair sé nuair a chuaigh sé faoi lámh Easpaig. Eugene, known to his family as ‘Sam’ was eight years old in 1916. He was shot on the Friday of the Easter Rising near Richmond Barracks in Inchicore. He died from the gunshot wounds. Bhí Eugene, nó ‘Sam’ mar a thabharfadh a theaghlach air ocht mbliana d’aois i 1916. Caitheadh é Aoine Éirí Amach na Cásca gar do Dhún Richmond in Inse Chór. Fuair sé bás de bharr gortuithe ó urchar. Bridget lived on 10 Henry Place, near Moore Street in Dublin City. She was accidentally shot on Friday April 28th as the Rising was ending. As the rebels retreated from the GPO, James Connolly, Padraig Pearse, Thomas Clarke, Joseph Plunkett and Sean Mac Diarmada took shelter in Bridget's house while Michael Collins and Sean Lemass built a barricade outside. In the chaos and confusion of the rebels trying to take shelter, Bridget was accidentally shot in the head when a rebel's rifle discharged. Bhí cónaí ar Bridget i 10 Plás Anraí, gar do Shráid an Mhúraigh i gCathair Bhaile Átha Cliath. Lámhachadh trí thimpiste í Dé hAoine, an 28 Aibreán nuair a bhí deireadh ag teacht leis an Éirí Amach. De réir mar a chúlaigh na reibiliúnaigh ó Ard-Oifig an Phoist, fuair Séamus Ó Conghaile, Pádraig Mac Piarais, Tomás Ó Cléirigh, Seosamh Pluincéad agus Seán Mac Diarmada tearmann i dteach Bridget agus thóg Micheál Ó Coileáin agus Seán Lemass baracáid taobh amuigh. Sa ruaille buaille agus sa mhíthuiscint a bhain do na reibiliúnaigh agus iad ag iarraidh tearmann a ghlacadh, caitheadh urchar trí thimpiste le Bridget sa cheann nuair a scaoileadh raidhfil duine de na reibiliúnaigh. John was 12 years old when he died on Friday April 28th 1916 from a gunshot wound on Grafton Street - he had an orange in his pocket. He lived in nearby York Street, where in 43 tenement houses, 267 families lived - over one thousand people. Bhí John 12 bhliain d’aois nuair a fuair sé bás Dé hAoine, an 28 Aibreán 1916 ó ghortú urchair ar Shráid Grafton – bhí oráiste ina phóca aige. Bhí cónaí air ar Shráid Eabhrac in aice láimhe, áit ina raibh cónaí ar 267 teaghlach i 43 tionóntán – os cionn míle duine. William lived very close to Sackville Street, on Moore Place, and was accidentally shot and killed at his home as the rebels retreated from the GPO. He received no medical attention and his mother was with him when he died. Like most of the children who died, he is buried in an unmarked grave in Glasnevin Cemetery. Bhí cónaí ar William an-ghar do Shráid Sackville, ar Phlás an Mhúraigh, agus lámhachadh agus maraíodh trí thimpiste é ag a theach nuair a bhí na reibiliúnaigh ag tarraingt amach as Ard-Oifig an Phoist. Níor cuireadh aon chóir leighis air agus bhí a mháthair in éineacht leis nuair a fuair sé bás. Ach an oiread le cuid mhaith de na leanaí a fuair bás, cuireadh in uaigh gan ainm é i Reilig Ghlas Naíon. Joseph was from Augustine Street. His mother had died in 1913 from tuberculosis (TB). He had one sister and three brothers. His father John was a casual labourer who died soon afterwards. Joseph was shot and died on Friday 28 April when he was on his way to Ryan’s Grocery for food for his family. Ba as Sráid San Agaistín do Joseph. Fuair a mháthair bás i 1913 ón eitinn. Bhí deirfiúr amháin agus triúr deartháireacha aige. B’oibrí sealadach a bhí ina athair John a fuair bás go gairid ina dhiaidh sin. Lámhachadh Joseph Dé hAoine, an 28 Aibreán agus é ar a bhealach chuig an siopa chun bia a fháil dá mhuintir. William was 16 when he died in Dublin during the Easter Rising. He lived on Church Street in Dublin City. He was working as a labourer. He was buried in Glasnevin Cemetery with his mother and two sisters. Bhí William 16 bliana d’aois nuair a fuair sé bás i mBaile Átha Cliath i rith Éirí Amach na Cásca. Bhí cónaí air ar Shráid an Teampaill i gCathair Bhaile Átha Cliath. Bhí sé ag obair mar oibrí sealadach. Cuireadh é i Reilig Ghlas Naíon lena mháthair agus lena bheirt deirfiúracha. ‘Male' O’Toole’s death certificate states that he died on Easter Monday. He died from gunshot wounds. All research into this death certificate and the 1911 census points to this being a boy called Christopher who was in a workhouse until 1912. It is thought that he might have been homeless and survived on the streets by himself in the years leading up to 1916. Luaitear ar theastas báis ‘Male' O’Toole go bhfuair sé bás ar Luan Cásca. Bhásaigh sé ó ghortuithe óna chaite. Sa taighde go léir a rinneadh ar a theastas báis agus ar dhaonáireamh 1911 dírítear ar bhuachaill darbh ainm Christopher a bhí ag cur faoi i dteach na mbocht go dtí 1912. Meastar go mb’fhéidir nach raibh teach ná áras aige agus gur mhair sé ar na sráideanna sna blianta suas go dtí 1916. Mary was 16 when she died in Dublin during the Easter Rising. Mary was a bottle washer. She lived with her mother Alice, four brothers and sisters, granddad John and his brother Richard, near the Four Courts in Dublin. She had stepped out of her home to help a civilian in distress when she was shot. Bhí Mary 16 bliana d’aois nuair a fuair sí bás i mBaile Átha Cliath i rith Éirí Amach na Cásca. Ba niteoir buidéal í Mary. Bhí cónaí uirthi lena máthair Alice, lena ceathrar deartháireacha agus deirfiúracha, lena seanathair John agus lena dheartháir siúd Richard, gar do na Ceithre Cúirteanna i mBaile Átha Cliath. Ní raibh sí ach taobh amuigh dá teach ag cuidiú le duine éigin a raibh anó éigin air nuair a lámhachadh í.
Patrick was from Sitric Place in Stoneybatter and was 13 when he died. His family believe he was shot on Sackville Street. Patrick’s Father, James, was in the British Army from the outbreak of World War I. He was one of five children, two of whom died before Patrick. Ba as Plás Shitric ar Bhóthar na gCloch Patrick agus bhí sé 13 bliana d’aois nuair a fuair sé bás. Creideann a theaghlach gur lámhachadh é ar Shráid Sackville. Bhí athair Patrick, James, in Arm na Breataine ó thosaigh an Chéad Chogadh Domhanda. Ba dhuine de chúigear leanaí é Patrick, a bhfuair beirt acu bás roimh Patrick. George died from a gunshot wound at 54 Haroldville Terrace, Rialto on April 27th. He was 9 years old and received no medical attention. His brother was also shot and wounded. His mother Edith Annie was from Kildare. His father was a managing clerk in a solicitor’s office in Dublin City, the premises of which were destroyed in the Rising. George's father died of TB in 1917. Fuair George bás de bharr gortú a bhain dó nuair a lámhachadh é i 54 Ascaill Bhailtín Araild, Rialto, an 27 Aibreán. Bhí sé 9 mbliana d’aois agus ní bhfuair sé aon chóir leighis. Lámhachadh a dheartháir freisin agus bhain gortuithe dó. Ba as Cill Dara a mháthair Edith Annie. Ba chléireach bainistíochta in oifig aturnae i gCathair Bhaile Átha Cliath a athair, scriosadh an foirgneamh sin san Éirí Amach. Fuair athair George bás ón eitinn i 1917. Walter was shot, along with a school friend, by a bullet from the gunship Helga near East Wall. When he was shot he was taken by fire brigade ambulance to Mercer's Hospital. He later died in the hospital on 5th July 1916 due to blood poisoning. He was probably the last child to die as a result of the Easter Rising. B’urchar ón long cogaidh Helga a mharaigh Walter, nuair a lámhachadh é féin agus cara scoile leis gar don Phort Thoir. Thug otharcharr na briogáide dóiteáin chuig Ospidéal Mercer é tar éis a chaite. Fuair sé bás san ospidéal níos déanaí an 5 Iúil 1916 mar gheall ar nimhiú fola. Seans gurbh é an leanbh deiridh a fuair bás de bharr Éirí Amach na Cásca é.
Bridget lived in 3 Pembroke Cottages in Dublin City. She was 11 years old when she died from a bullet wound on the 28th April at Royal City Hospital on Baggot Street. Her older sister Mary was with her when she died. Mary died shortly afterwards from TB. Bhí cónaí ar Bridget i 3 Iostáin Pheambróg i gCathair Bhaile Átha Cliath. Bhí sí 11 bhliain d’aois nuair a fuair sí bás de bharr gortaithe ó urchar an 28 Aibreán ag Ospidéal Ríoga na Cathrach ar Shráid Bhagóid. Bhí a deirfiúr Mary a bhí níos sine ná í in éineacht léi nuair a fuair sí bás. Fuair Mary bás go gairid ina dhiaidh sin de bharr na heitinne. Lionel went missing during Easter Week and his body was never found. His family searched extensively for him. His family believe he was killed on Mount Street on Wednesday 26th April while giving a wounded soldier a drink of water. Chuaigh Lionel ar iarraidh i rith Sheachtain na Cásca agus ní bhfuarthas a chorp riamh. Chuardaigh a mhuintir dó go forleathan. Creideann a mhuintir go bhfuair sé bás ar Shráid an Mhóta Dé Céadaoin, an 26 Aibreán, agus gur maraíodh é le linn dó a bheith ag tabhairt deoch uisce do shaighdiúir gortaithe. Madge was shot while looking out the window of her house, 103 Haddington Road. Wearing green and using binoculars to look out the window, soldiers in a nearby lane mistook her for a rebel and shot her. She was brought to Royal City Hospital on Baggot Street using a mattress and a ladder as a stretcher, but didn't survive. Lámhachadh Madge agus í ag breathnú amach fuinneog a tí, 103 Bóthar Haddington. Bhí éadaí glasa uirthi agus bhí déshúiligh aici le breathnú amach – cheap saighdiúirí gur reibiliúnach a bhí inti agus chaith siad léi. Tugadh chuig Ospidéal Ríoga na Cathrach í ar Shráid Bhagóid agus tocht agus dréimire acu chun í a thabhairt isteach, ach níor tháinig sí slán. Philip was from Hackett’s Court in Dublin City - the street is now gone. He was shot in the abdomen and died in nearby Mercer's Hospital. In his tenement, six families lived in five rooms. He was buried in an unmarked grave in Glasnevin Cemetery. Ba as Cúirt Haicéid i gCathair Bhaile Átha Cliath do Philip – níl an tsráid sin ann níos mó. Caitheadh sa bholg é agus fuair sé bás in Ospidéal Mercer in aice láimhe. Bhí sé theaghlach ag cur fúthu i gcúig sheomra codlata ina thionóntán. Cuireadh in uaigh gan ainm é i Reilig Ghlas Naíon. Eleanor lived on Fumbally Lane in Dublin. She died from a gunshot through the jaw. Two of her brothers died in World War I, and a sister also predeceased. She lived with her parents and was one of six siblings. Bhí cónaí ar Eleanor ar Lána Fumbally i mBaile Átha Cliath. Fuair sí bás de bharr a caite, nuair a cuireadh urchar trína giall. Fuair beirt dá deartháireacha bás sa Chéad Chogadh Domhanda, agus fuair a deirfiúr bás freisin. Bhí cónaí uirthi lena máthair, lena hathair agus lena seisear deartháireacha agus deirfiúracha. Christopher lived on North Great George’s Street where his father ran a small hotel. He was in bed reading a book when a stray bullet came through the window and killed him. He was a messenger boy for Eason's and travelled around the city on his bike to make his deliveries. Bhí cónaí ar Christopher ar Shráid Sheoirse Mhór Thuaidh, áit a raibh óstán beag ag a athair. Bhí sé ina luí sa leaba ag léamh nuair a tháinig urchar fánach tríd an bhfuinneog agus maraíodh é. Ba theachtaire é do shiopa Eason agus théadh sé timpeall na cathrach ar a rothar ina chuid oibre. Boy, unidentified, 4th May 1916. Killed by gunfire. Buachaill, gan ainm, an 4 Bealtaine 1916. Maraíodh é i scaoileadh gunnaí. Infant, unidentified, 4th May 1916. Killed by gunfire. Naíonán, gan ainm, an 4 Bealtaine 1916. Maraithe i scaoileadh gunnaí.